I was watching DS9: Family Business when I noticed all the doors on Ferenginar are much shorter than the average Ferengi, causing them to crouch down every time they enter a room. That's gotta be terrible for their backs! I understand that Ferengi are shorter than the average humanoid, but why would they make the doors on their own home world too short for themselves?! There are no windows, but there are a few doors leading to other parts of the building. The doors are low and tunnel-like and even Ferengi have to stoop to get through them. Rain from Ferenginar's relentless downpour can be heard beating against the roof. Quark and Rom ENTER, followed by Brunt. Each Ferengi deposits a coin in a collection box by the door, then removes a towel from a rack, and begins blotting off the rain. The fact that they look like tunnel entrances may be a nod to the fact that the Ferengi are more animalistic, living in literal dens that have been modernised. 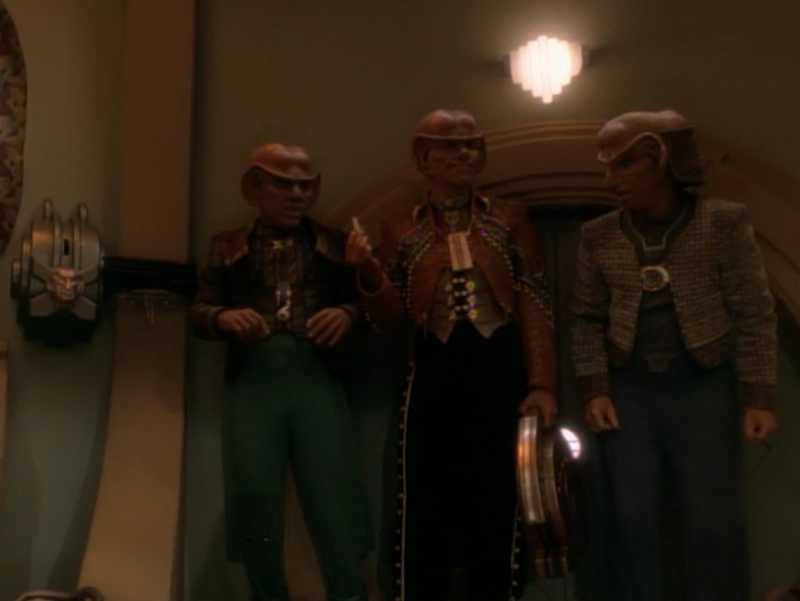 I've seen web-chatter that one of the EU novels mentions that the doorways became smaller over time as the Ferengi realised that they were among the shortest of the Alpha quadrant races, as a form of compensation for their obvious inferiority. Not the answer you're looking for? Browse other questions tagged star-trek star-trek-ds9 ferengi or ask your own question. Why didn't the Ferengi just steal the whole NX-01? Why didn't the Ferengi Commerce Authority take Quark's mother's house and possessions? Why are the Ferengi classed as Species 180, by the Borg? Why are desiccated Ferengi green? Are the Ferengi the richest and most powerful civilization in the Star Trek world given that they are the most driven by the pursuit of money? Why do the Ferengi keep their women naked? Are the Ferengi racially discriminated against by members of the Federation? Why did the Ferengi stay there in “The Price” after Geordi's warning?